Giants quarterback is due to be paid roster bonus if he is on the team at 4 p.m. Monday (the fifth day of the new league year) and every indication is that he will be. And on the fifth day, the Giants created some clarity at quarterback. They are due to pay Eli Manning a $5 million roster bonus if he is on the team at 4 p.m. Monday (the fifth day of the new league year) and every indication is that he will be. That’s a substantial enough investment in the 38-year-old quarterback to presume that he’ll be with the team and most likely under center for the start of the 2019 season. The $5 million also makes it likely that Manning will become the highest-paid player in NFL history by the fall. He is due $17 million in base salary this season, a number that will be guaranteed when he is on the roster in Week 1 of the season. That will boost his career earnings to $252.3 million, surpassing his brother Peyton Manning who earned $248 million in career earnings. Does it absolutely guarantee Manning will have a 16th season with the Giants, something no player has ever done in the history of the franchise? General manager Dave Gettleman paid Odell Beckham Jr. over $20 million and seven months later traded him, so nothing is ever really outside the realm of possibility for the Giants these days. But all signs point to Manning sticking around for the upcoming season. It will be the final year on his contract and, barring an extension, will be the first time in his career he’ll play under such a lame-duck scenario. What the $5 million payout will not affect or preclude is the Giants’ possible selection of another quarterback in the draft next month. They have 12 picks, two in the first round, and have expressed a fondness for what Gettleman has called the “Kansas City model” of having a rookie quarterback sit and learn behind an established veteran. 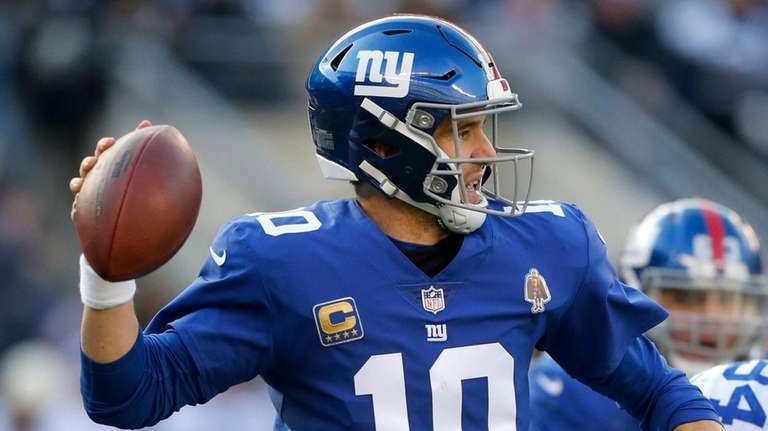 There is no guarantee that the Giants will take a quarterback in this draft, but if they do it will likely be with the eye of him playing behind Manning for at least the first part of the 2019 season. Manning has not spoken publicly to address that “model” or the likelihood that 2019 will be his farewell tour and last season with the Giants. Gettleman and Pat Shurmur gave their backing to Manning when they spoke at the Combine last month. Shurmur pointed out the level to which Manning played in the second half of last season when those around him started to play better. Manning finished with a career-high completion percentage with 21 touchdowns and 11 interceptions. Gettleman railed against the negative narrative that has surrounded Manning for the past four-to-five years. “You’ve got to take everything for what it’s worth at that time and I think that the narrative has been negative, and I don’t think it’s been fair,” Gettleman said.